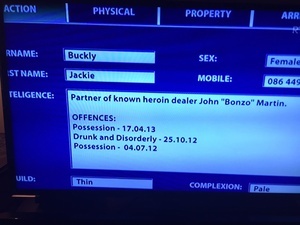 On RTÉ’s News at One. RTÉ’s Crime Correspondent Paul Reynolds reported that two senior members of the Association of Garda Sergeants and Inspectors are not attending the group’s annual conference which began in Cavan today. Mr Reynolds said the decision of AGSI’s vice president Paul Wallace and its deputy general secretary Antoinette Cunningham not to attend followed the news that one of its members if being investigated by the National Bureau of Criminal Investigations. “The allegation is that the member engaged in prohibitive spare time activities – specifically, engaged in outside security work, which is not permitted under the Garda code. “Two protected disclosures have been put in, in relation to this. It’s being investigated by the National Bureau of Criminal Investigation. “And the allegation also contains claims that false alarms were set off at a business and these were responded to by gardaí, in squad cars, patrol cars, in emergency fashion, with sirens blaring and lights flashing. Mr Jacob also said the AGSI does not know who the allegation allegedly concerns. Posted in Misc and tagged False alarms, gardai, PULSE, responded to at 2:19 pm on April 15, 2019 by Bodger. 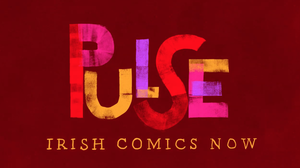 PULSE – Irish Comics Now takes place tonight at 6.30pm in the Mart Firestation Gallery, Rathmines. There’ll be a pop-up comics fair, live performances of comic books and a Q&A. It takes place as part of the French/Irish Comic Book Festival taking place today and tomorrow. Brought to you by Illustrators Ireland, The Comics Lab and Alliance Francaise. Entry free. See here for a full programme of events. Posted in Misc and tagged Irish Comics, PULSE at 12:03 pm on March 2, 2016 by Broadsheet. “Referencing allegations that a number of Gardaí used the PULSE system to access information about the Dublin North’s 2013 arrest for suspected drink-driving, [former justice minister Alan] Shatter said he had found the incident very worrying. “What isn’t generally publicly known is that I raised that issue with the Garda authorities and I expressed concern as to how that came about. 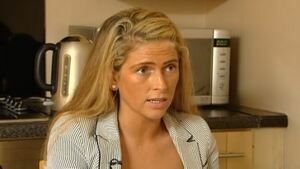 Report of Alan Shatter on Newstalk about Clare Daly’s arrest and subsequent outing in the media and the Garda leaks. The quote from the Independent suggests that Shatter is saying some 150 Gardai accessed the Pulse system to check details of Clare Daly’s arrest.If he was referring to 150 Gardai then this tops even the amount of civil servants who accessed Dolores McNamaras social welfare files after she won the EuroMillions Lottery. In that episode I think it was 106 civil servants but the Gardai seem to have outdone them for breach of privacy when it came to Clare Daly and her drink driving arrest…. Posted in Misc and tagged Alan Shatter, PULSE at 2:44 pm on January 28, 2016 by Broadsheet. So… remember those 1700 firearms that were listed by the Gardai as having been stolen from 2010 to 2014 in all the tabloids of late? Interesting written question in the Dail on Tuesday this week, saw an infodump of raw data from PULSE regarding those. Some interesting questions pop up. Why is there a fully automatic rifle listed, when only Gardai and the Defence Forces can own them? 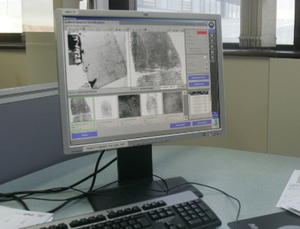 Was one stolen from the Gardai in the Eastern Dublin Metropolitan Region in 2011? Why are there 54 replicas listed as real firearms when they can’t shoot bullets? 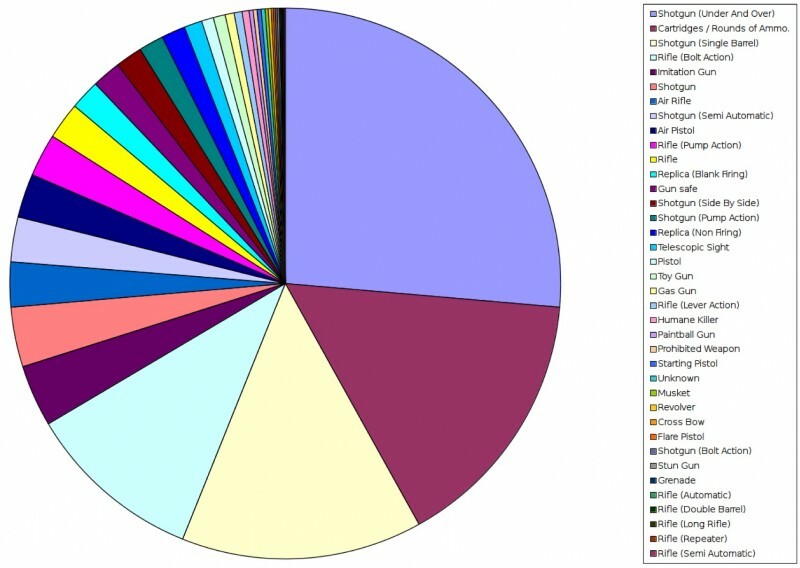 Why are there 266 rounds of ammunition listed as individual firearms in the numbers? Why were 18 telescopes listed as individual firearms? Why are there 29 gun safes, 62 imitation guns and 12 toy guns listed as firearms when under the Firearms Act, those three categories are not legally firearms even within the enormously wide definition of that term in Irish law? And did anyone think to tell the media that those figures were a wee bit misleading? I don’t remember too many firearms licences being issued for grenades, for example, but there’s one in there. Was a grenade stolen from the Army in Tipperary in 2010? Posted in Misc and tagged firearms, PULSE at 9:04 am on March 6, 2015 by Broadsheet. No one can stop them. The garda report on the penalty points system has found six senior gardaí continued to cancel penalty points in breach of policy and outside their own areas despite directions from the commissioner that the practice was to cease. RTÉ News has also learned the report identifies nine cases where senior officers cancelled points and seven more instances where points were cancelled on questionable grounds even after the Commissioner Nóirín O’Sullivan introduced new procedures last June. 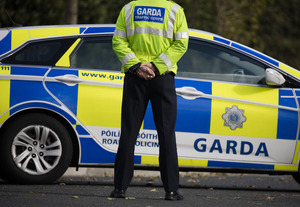 Posted in Misc and tagged An Garda Síochána, Penalty Points, PULSE at 8:09 am on January 23, 2015 by Broadsheet. Posted in Misc and tagged Love/Hate, PULSE, typo at 11:33 pm on November 2, 2014 by Broadsheet. Irish Examiner journalist, Michael Clifford; former Irish Independent journalist, Gemma O’Doherty; Fianna Fáil TD, Sean Fleming; and Pavee Point co-director, Martin Collins appeared on TV3’s Tonight With Vincent Browne last night. They discussed the matter of Traveller children being placed on PULSE and being given criminal intelligence numbers – some allegedly as young as 16 days old. It followed Ms O’Doherty’s story in The Sunday Times in which she told how the two children of Caroline Dunne, a Traveller who lives in Cork, were placed on the PULSE system after Ms Dunne went to a garda station to get passport forms signed in 2011. Ms Dunne’s children, Francis and Mary, were aged two and one at the time. Ms Dunne first learned about her children being on PULSE when Ms O’Doherty told her at the weekend. During last night’s show, Vincent played a video interview between Ms Dunne and Lisa-Marie Berry. Berry: Can you think of any reason why the gardaí would keep such intelligence on your children? Posted in Misc and tagged PULSE, Traveller children, Vincent Browne at 7:48 am on March 25, 2014 by Broadsheet. You’ll recall two posts about allegations of Traveller children being placed on the PULSE system. The first, from October last year, included a letter that former Garda John Wilson sent to his senior management in October 2011, alleging that many Traveller babies – one as young as 16 days old – had their names put on the PULSE system, with each child getting a criminal intelligence PULSE number. Mr Wilson has yet to receive a reply for this letter. The second, earlier this month, detailed questions put to Justice Minister Alan Shatter in relation to the allegations by TDs Clare Daly, of United Left Alliance, and Padraig MachLochlainn, of Sinn Féin, and Mr Shatter’s response. Essentially, the two TDs asked Minister Shatter to confirm the allegations. 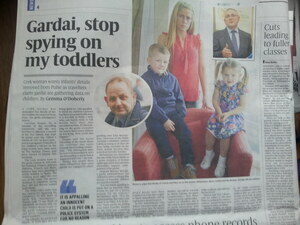 Yesterday, in the Sunday Times, above, former Irish Independent journalist Gemma O’Doherty wrote about Cork Traveller Caroline Dunne, whose son Francis and daughter Mary’s details were placed on PULSE after Ms Dunne went to a Garda station in 2011 to get passport forms for her children signed. The children were aged two and one at the time. “Printouts of her children’s entries on the Pulse system have been seen by The Sunday Times, and were shown to Dunne this weekend…The Pulse entry states that the reason for inputting the children’s UD and dates of birth was ‘intelligence’. Posted in Misc and tagged Caroline Dunne, PULSE, Traveller children at 11:42 am on March 24, 2014 by Broadsheet. Data Protection Commissioner Billy Hawkes spoke to Richard Crowley on RTÉ News at One, following the publication of his office’s audit of data protection in An Garda Síochána from 2011 to October 2013. 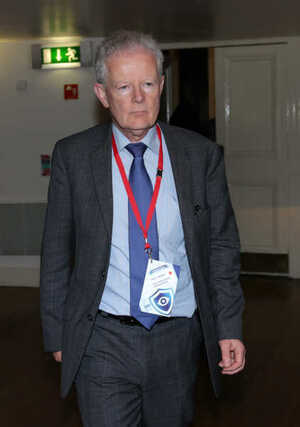 Specifically, Mr Hawkes told how, during his investigation, he found incidences whereby members of Gardaí – not the whistleblowers Sgt Maurice McCabe and former Garda John Wilson – accessed the Garda profiles of certain ‘RTÉ celebrities’, passed on information to private investigators and also accessed information in the Department of Social Protection. Posted in Misc and tagged Billy Hawkes, Data Commissioner, PULSE, RTE, Whistleblowers at 3:18 pm on March 21, 2014 by Broadsheet. You may recall a post from last October in which we posted the letter, above, Garda John Wilson wrote to his senior management in October 2011. Mr Wilson alleged that many Traveller babies – one as young as 16 days old – had their names put on the PULSE system, with each child getting a criminal intelligence PULSE number. Mr Wilson claimed it could happen if a Garda stopped a car driven by a Traveller, and if there were children present in the car, those children’s names would be placed on PULSE. Mr Wilson said gardaí were encouraged to do this by senior gardaí. At the time of posting last October, Mr Wilson had yet to receive a reply from Garda management. Justice Minister Alan Shatter replied to written questions put to him on the matter by United Left Alliance TD, Clare Daly and Sinn Féin TD, Padraig MacLochlainn, on Tuesday. Clare Daly: To ask the Minister for Justice and Equality if a PULSE file was created on a Traveller child when that child was 16 days old; and was this child ascribed a criminal intelligence number separate from a parent or guardian. Padraig MacLochlainn: To ask the Minister for Justice and Equality the steps he has taken to confirm whether Traveller children or adults are being assigned separate criminal intelligence PULSE numbers without having committed any criminal conduct; and the action he will take regarding same. Padraig MacLochlainn: To ask the Minister for Justice and Equality if he has established with the Garda Commissioner the veracity of the allegations that 40 Traveller families were entered on the Garda PULSE system, including a baby of 16 days old; and if he will make a statement on the matter. Justice Minister Alan Shatter took the three questions together. Alan Shatter: “The management of the PULSE system is an operational matter for the Garda Commissioner. While An Garda Síochána does not comment on individual cases, I am informed by the Commissioner that PULSE does not solely capture information on offenders, but is also used to store information on Garda interactions with individuals, whether adults or children, such as victims of crime, persons injured in road traffic accidents and child welfare incidents. All persons are subject to the same PULSE recording policy and procedures. 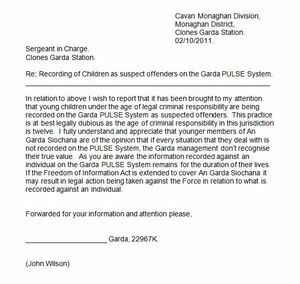 Posted in Misc and tagged Alan Shatter, Martin Callinan, PULSE, Traveller children at 3:21 pm on March 14, 2014 by Broadsheet.